I don't think Brandon has flown his plane yet ? Brandon ? Eeeeeeeewwwwwwwwww a pink Lazair???? Now Ive seen everything! I have a stock series II with the narrow gear....can someone remind me WHY I would want wider gear? As soon as Im moving forward I'm flying this lady, so Im not sure where wide gear would help?.....as a mater of fact, isn't a narrow gear even better for tracking? That gear diagramed is going to place a tremendous torque in the tube around the welds, because of the sweep back of the gear. It will be acting like a torsion bar, and be nice and springy....It could fail around the welds after a number of hard landings or bumpy runways. Dont forget a hard landing can easily create 2 G on the gear, and it does not look adequate for many 900lb loadings. I wonder if anyone here has had a failed landing gear experience.....it would be interesting to see where it broke. this is why wide gear is better, eh flyalaz? wide gear like on a ser 3 is all you need. i seen many novices flying the ser and 2 narrow gear over hte last 25 years and the gear is not really a big issue. the rudder pedals were a better asset than the wider gear at the time. Cross control was fun in the X winds. slapping your stick around to get tail straight. If you taxing on eneven ground the narrow gear an be a bit tippy. but like ray said the wider the gear the more strain somewhere else. Gee Tyler, thanks for sending in such a flattering picture! Just so everybody knows, it was a gusty day, ok, and not cowboy flying that put me in that elegant pose. When my plane was just sitting there parked next to Steve's wide track, I had to bring the wing back down several times, while the wide track gear just wobbled a little. Stable, yes, but I think the narrow gear is a little more aerodynamic tucked in closer to the pilot, and my little fairing hides it even more. Maybe I will get a chance to sample wide track if I can get all the parts for my other rebuild project! Just going through some of the old pics from last summer, and I came across this one. Most people use the pull starters though, but if you have a talent.....Hee hee! Are you going to make it back here this year? A little more formation flying would be a blast. Who knows, maybe there will be more this year. Dave should be up and running, and join in the flight too. 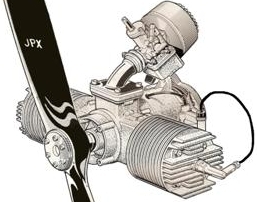 btw i can hand prop a rotax on a gear box but never been able to on a jpx or a rotax., never tried a pioneer . Maybe we should start a zingers string! We can always use a good laugh. I don't mind laughing at myself, that way I beat other people to the punch! Here's a good laugh !